After some struggle I proudly present you my new cherry blossom ball! This lovely kusudama is by 布施知子/ FUSE Tomoko. Find it in 折紙探偵団 MAGAZINE 通巻72号 /Origami Tanteidan number 72. Now a little explanation about its’ name: this beauty is called てまり桜; the てまり・手鞠 is a japanese hand ball and the 桜, cherry blossom. This is different from the 桜玉 that is made with 桜, meaning cherry blossom, and 玉, meaning ball; so as you can see even though both mean cherry blossom ball their origin is quite different… As some more (useless) trivia you can see some new year “temari” in this site that is basically about flower arrangements. Or so says the title since I’m feeling too lazy to check it all out. Another “temari” can be found in this Kawasakidaishi wind chime festival post. For the curious: Kawasaki Daishi is a temple; for more english info visit the Kawasaki Daishi english site. Another useful info: you can assemble these without glue! Just have some paper scotch tape ready for assembling aid. Actually I don’t know if this is the real english name; it’s a tape that painters use sometimes when painting that glues easily on every dry surface and leaves absolutely no mark when you take it off. Perhaps it is called painter’s tape? In here the most common one is a beige one but I have seen in it blue too. I use the beige. Just “glue” the assembled units with the tape on the outside. 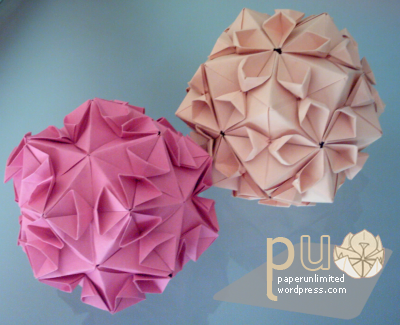 After you tuck in the last unit you can remove the tape to discover a pretty flowery kusudama looking at you. This entry was posted on 2007|08|29 at 09:31 and is filed under kusudama, modular origami, sakuradama. You can follow any responses to this entry through the RSS 2.0 feed. You can leave a response, or trackback from your own site. AHA! I saw your second version of this design in red and immediately thought “That’s something right out of Fuse-sensei’s world.” Thanks for sharing what Tanteidan it’s in. You fold very well, and very cleanly! Lovely photos. How/where do you buy Tanteidan convention books..? I loved the both! Do you think you can send me the diagram? I would love to do it!!! Thanks and congratulations!!! Sooo lovely! May I have a copy of the diagrams for making the Cherry Blossom Ball by Tomoko Fuse? Your folding is so neat and precise! I call it Masking Tape… :) but I don’t know if it’s only in my corner of the world..
Cant wait to fold one for myself. I’ve been looking for a diagram for these for YEARS! please if you would send me the diagram id be so very greatful! I love the kusudama too. Mind to share the diagram with me. I would love to make one too!!! I would love to have the diagram for this. I LOVE IT! Thanks! I love your kusudama as well. If you are sending the diagram for those that ask, I would love it. OOH this is beautiful!Please send me the diagram!! very beautiful and nicely folded! i’m from portugal. i’m kusudama fan but there is so little information about it in my country. would you mind to cheer the diagram? Hi! I love all your work! They’re so beautiful! The cherry blossoms are my favorite. :) can you send me the diagrams please? I would love to make one! Thanks! I am in love…. Do you mind sending me a diagram? Great work with this kusudama! The final effect of the cherry blossom is so wonderful! I would love to make one cherry blossom… do you mind sending me the diagram? The beige tape you are talking about is called “masking tape” and it does come in blue. The beige kind is usually less expensive but has a lower quality adhesive that can dry to the surface if left for too long. The blue “painter’s tape” is usually rated by the length of time it can be left with out damaging the surface it is adhered to (24 hours, 48 hours etc) and the price raises with the time it stays removable. Also I love the cherry blossom kusudama. How long did it take to make the units? I can usually get moderate sized sonobe units done in couple hours. I was thinking of buying the book if the diagram isn’t available for free and making these for my wedding to hang on the chairs. Can i have a copy of the diagram please? Hallo! Wow, this kusudama is soo cute, I love it! 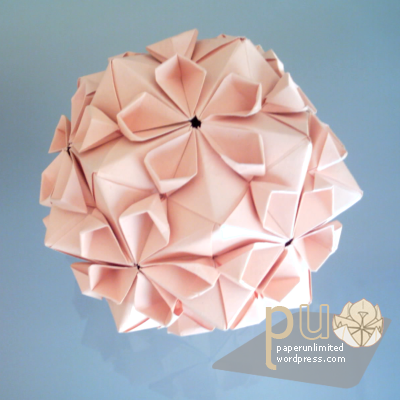 Would you please send me the diagram of the cherry blossom ball kusudama?! That would be great, thank you in advance. can i hv a copy of the diagram plz? so cool! the peach one looks so pwetty! would u be able to send me a copy of the diagram too? lovely!! are the diagrams available online or in pdf form? i would love to try folding this! also: masking tape is one type of removable tape, but in art class we call it drafting tape (which is blue). we don’t use masking tape on an art piece if we want to be sure it will come off w/o damaging anything! Hi there, I’ve been researching some origami designs which my fiancée and I can create as wedding decor. May I ask for a copy of the diagrams to create these wonderful works of art? Oh, this is pretty!! I know it must be bother, but could you send a diagram of this to me? And I apologize for my english, it is not my main language. Can I have the diagram? It’s so cute! Do you have any tips for the assembly of it? I find it hard to assemble them.